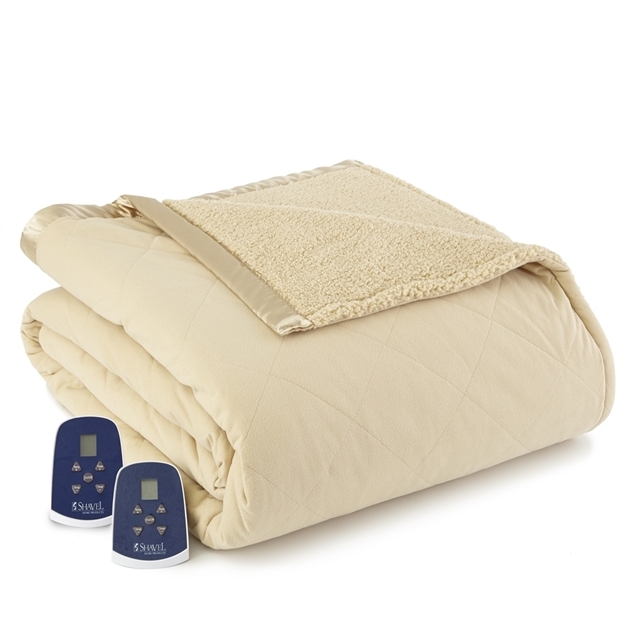 Warm and soft tan chino Micro Flannel® heated electric blankets brighten and warm up any room with a reversing classic quilted to sherpa top and our superior quality construction. 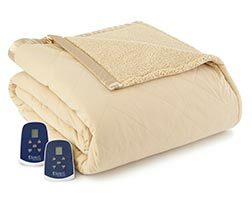 Enjoy the best in heated comfort and style anywhere in your home with our satin-trimmed light tan Micro Flannel® heated electric sherpa blanket. Our soft, luxurious quilted sherpa blanket features our patented 7 Layers of Warmth™, including Micro Flannel®, down alternative fill, specially-crafted electrical cloth, and a quilted layer of heating elements. Reversable top from Quilted to Sherpa. Combine durability and practicality with a superior heated blanket that is machine washable, lightweight, and bulk-free.